Fact: Your Windows PC is slowing down. Maybe it takes longer to boot up or shut down. Perhaps the hard drive grinds in the background constantly. Or maybe launching an application takes much longer than it once did. And although Windows 7 is speedier than previous versions, it can still become sluggish, particularly if you install and uninstall a lot of applications. In this article I'll look at what it takes to clean the crud out of your system that has built up over time. I'll specifically discuss boot times, hard-drive issues, and the mysterious Windows Registry. I'll also explain how you can minimize problems in the future and change your crud-inducing habits. Sometimes a PC will start to crawl without warning, and the reason isn't always obvious. Although the focus of this article is on cleaning and preventing operating-system gunk, it's worthwhile to touch briefly on a few hardware problems that can cause sudden slowdowns. If you built your system yourself, the BIOS may on occasion reset itself without your knowledge. This can happen during a power failure, or if you shut down the system during the POST process. During such a reset, the memory speeds may revert to something more conservative. You'll notice performance issues only when running memory-intensive apps. Another possibility is that the apparent amount of memory might shrink. For example, on recent motherboards built with Intel's P55 and X58 chipsets, a heat sink that's too tightly mounted can bend memory circuit traces on the board. The net result is that one memory module becomes invisible to the system, potentially reducing the amount of memory available to Windows by one-third or one-half. That hampers your system, particularly when apps and data are swapped to virtual memory on your hard drive. Modern Intel and AMD CPUs will automatically throttle down if they get too hot, which can happen if your system's CPU and case cooling fans become coated with dust and start slowing down. Be sure to check the system temperature in the BIOS, or with any utilities that may have shipped with your motherboard. As hard drives begin to develop bad sectors, they try to copy data to safe sectors. Ordinarily this occurs rarely--but when a drive starts to fail, the behavior could become more frequent. The net result is constant disk use, as the system attempts to find free, good sectors. If you suspect such activity, turn on the SMART feature in your PC's BIOS, which will pull diagnostic information from the drive and warn you if failure seems imminent. Now let's move on to Windows itself. Windows slowdown has three main causes: The Windows Registry gets bigger, DLLs and other junk are needlessly duplicated, and hard drives become fragmented. One other cause on machines that have a lot of programs installed is that a lot of background services and applications can be running, without your knowledge. These potential problems aren't mutually exclusive. The Registry can swell as you install more software, which in turn loads a lot of background tasks. Plus, your hard drive may fill up, making Windows auto-defragging harder. But let's look at these issues one at a time. That's a lot of apps. Windows maintains configuration settings, application install settings, and options in a database called the Windows Registry. 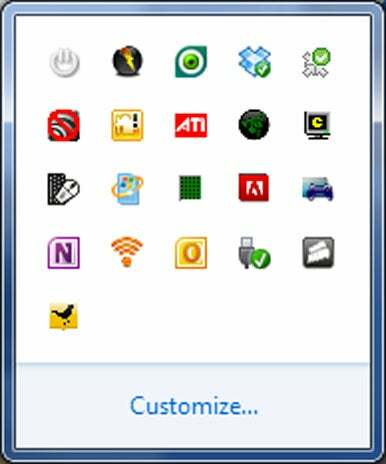 As you install and uninstall applications or make changes to Windows, the Registry tends to grow larger and larger. For example, the Registry on my production PC, which has a ton of apps installed, is about 384MB--and that's just a backup. As the Registry expands, applications and services that use it take longer to load. Searches conducted through the Registry by apps that may have written their data in multiple places also start to require more time. Some applications, such as security tools and certain media players (PowerDVD and the like), touch the data in a large number of locations. The other culprit behind Registry bloat is incomplete uninstalls. Most users install or uninstall only a few applications per year, but some people (gamers and power users come to mind) tend to install and remove many programs. Incomplete uninstalls leave residue in the Registry, which adds to its size. Windows 7 and its program uninstaller is much improved in this respect, but still not perfect. As it turns out, however, Registry cleaners aren't really the way to go. More on that later. You really need only one of these Visual C++ redistributables. When you install applications, sometimes they need various runtime modules to run. See all those separately installed copies of the Microsoft Visual C++ redistributable? You really need only the latest version. If you're running the 64-bit version, you might need two copies, one for 32-bit (labeled "x86") and one for 64-bit (x64). This is just one example of the kind of junk that can get installed on a system. It's hard to stop and track down, and determining whether removing it might break something is often difficult. The more stuff you install, the more the programs seem to install some kind of service in the background. Maybe that service will speed up an application launch. Maybe it's a control-panel applet for a high-end gaming mouse. That's an awful lot of stuff in my system tray. Do I really need Impulse Now running all the time? I use it only when I'm running a game downloaded from Stardock's Impulse digital-delivery system, or when I'm buying a game from there. I certainly don't need it. And I rarely use Microsoft OneNote, so that doesn't have to run either. A machine's file system will become fragmented eventually. 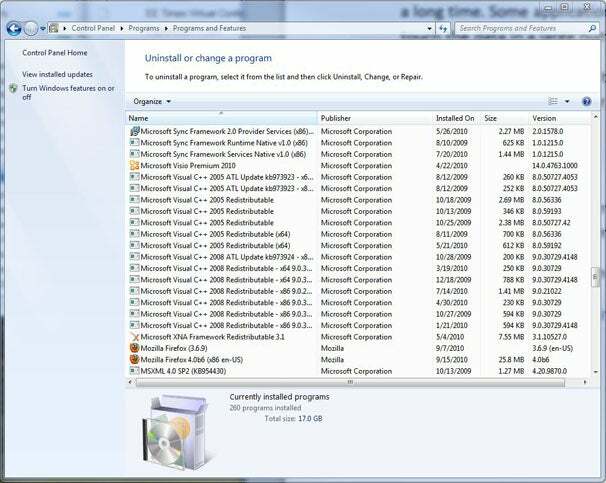 Windows 7 tries to minimize that by running the defragger in the background when the PC is idle. But if you frequently create and delete files (or use applications that create and delete files regularly), the file system is bound to become fragmented. System-performance issues can also crop up if the drive gets too full. If a drive is more than 90 percent full, swapping from main memory to the drive becomes very slow, which can drag down the system as a whole. It may be time to clean out your drive--or buy a bigger one. The Windows uninstaller--as well as similar uninstall apps that ship with some software--doesn't always completely remove an application. This shortcoming causes the Registry to balloon, leaves extraneous files on the hard drive, and otherwise cruds up a system. Here's how to keep your PC and other tech gear clean--on the outside and the inside. Grime can build up in your desktop PC, and port openings can get dirty. Here's how to clean your PC. The ultimate repair job doesn't have to be the ultimate disaster.